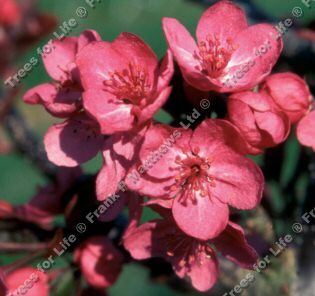 Cardinal (Malus 'Cardinal' syn. M.hupenhensis 'Cardinal') carries beautiful foliage and attractive, large, intense, pink, succulent flowers and dark almost black spring leaves changing to glossy red in summer. Deep red small fruit festoon the branches in the autumn. Originally introduced from the United States, Cardinal is a good choice of flowering crab apple for a small to medium sized garden. Just to let you know that the Cardinal Crab Apple trees arrived safely in Austria on Monday. They seem to be in good shape and I will plant them today.